Grey Zigzag Blue Dots Changing Pad Cover…. Ensure that your little one stays comfortable and secure with super soft Bacati Ikat Grey with Blue Dots Changing Pad Cover. 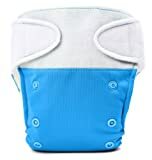 It is made with 100% cotton quilted muslin fabric on top with soft Polly fill to support and cushion your child while you change her diaper. It is accentuated with grey chording with zigzag gusset. It fits all standard changing pads. It is machine washable and gets softer with every wash. It is made from 100% cotton with poly fill. Size: 16 x 32 x 6 inches. It can be coordinated with Bacati Ikat Zigzag Bedding Collection. Cotton is a green fabric as it is renewable resource & biodegradable. Cotton is breathable making it more comfortable in extreme climates. Cotton is inherently soft delicate on skin of babies, durable & user friendly. Cottons gentle quality makes it appropriate for Babies with very sensitive skin or skin allergies. 18mm Black Rubber / Silicone Watch Band Strap with Built in Quick Release Pins for Divers! Michele Stainless Steel Buckle Invicta – Fit’s All Watches!!! 18mm Military Style Strap with Two S/S Rings and S/S Heavy Buckle. Great to Attach to Any Timepiece.